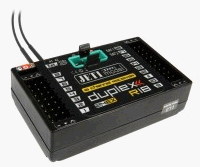 18 channel full-range receiver compatible with JETI EX & EX Bus protocols. Supports telemetry functions. Power supply is provided by MPX connector or standard JR connectors.